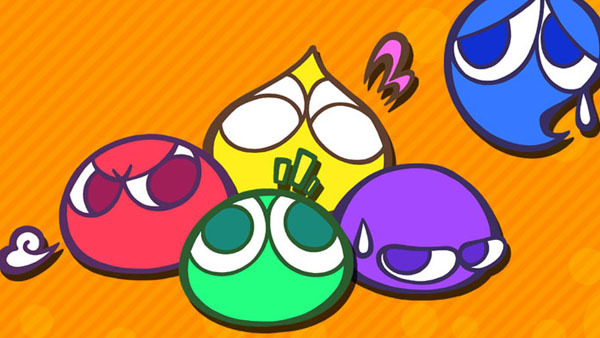 Finally, another Puyo Puyo game is headed for 3DS! Puyo Puyo Chronicle is a puzzle RPG that's coming to 3DS in Japan this December 8, complete with an Anniversary Box edition and standard edition. As part of the 25th anniversary celebration of the Puyo Puyo series, Puyo Puyo Chronicle will have a special RPG Mode with characters Arle and Carbuncle act as the game's protagonists. When Arle finds himself mysteriously whisked away into a strange land found inside a book, she meets a girl named Allie as she tries to figure out a way to get back to her home world. Here, you'll explore open 3D environments, complete quests, and battle with a team of three additional characters involving Puyos. Of course, you can play the regular Puyo Puyo mode instead of the RPG tale as well, with 17 modes available as well as one where four players take on a boss together, using the game's RPG system as a base. Puyo Puyo Chronicles will definitely be an interesting shift for the long-running series, and it's always great to see changes coming to familiar franchises, especially when they're this significant. I can't wait to give it a try. Hopefully it'll be localized! We'll have to wait and see.